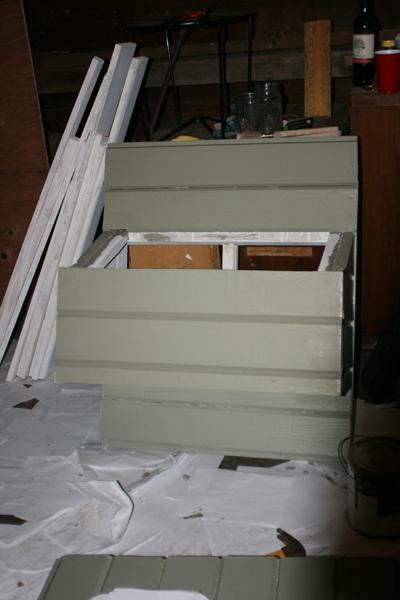 We thought about getting an old 4H project or converting a rabbit hutch or something into a chicken coop, but, in the end, we knew that we wouldn't be satisfied if we didn't make it ourselves! 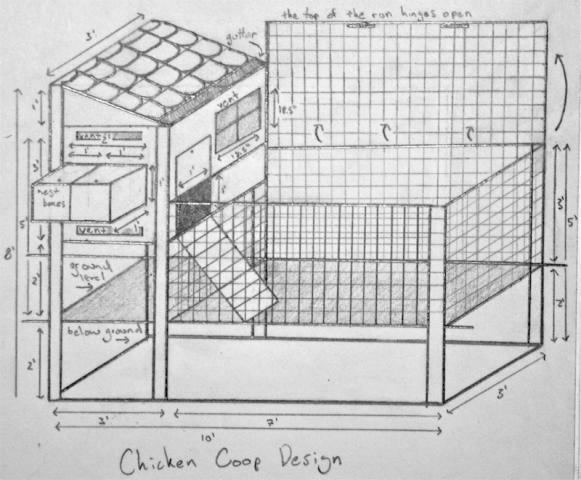 So, in anticipation of our future chickens, we started designing the coop in September, 2010. We didn't finish the coop until January and still haven't finished the run! 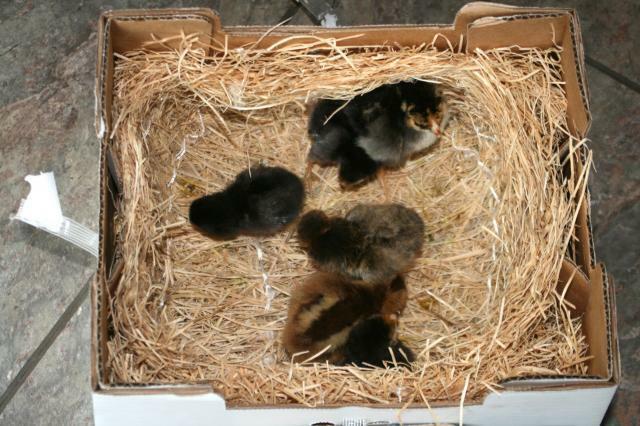 We wanted to have 3 chickens, but, since we could only ship 6 at a time (3 standard and 3 bantam), we started out with twice what we wanted! 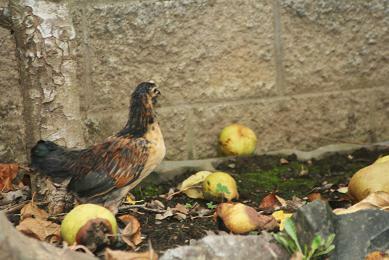 We thought that we would just keep the ones we liked the best or weed out the roosters. But, of course, that didn't work out! 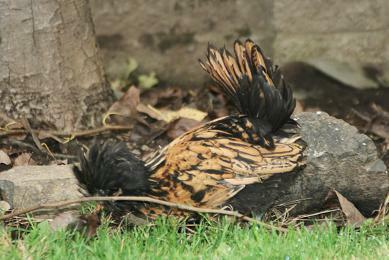 We ended up with 4 hens and 2 roosters. Which is a little more than we originally planned on, but we've decided to keep the girls and get rid of the boys. 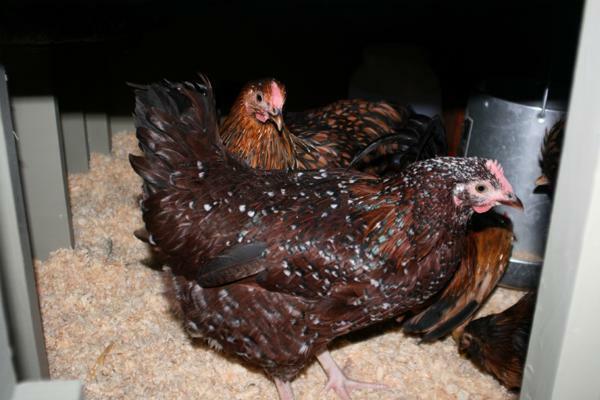 That gives us a Speckled Sussex, Belgian D'Anver, Golden Laced Wyandotte, Golden Laced Polish, and two extra Belgian D'Anver roos. To start off, we figured that this was the only place that the coop could actually go! Everywhere else was either already being used or right next to the road. So, unless we wanted to put them in the middle of the lawn, they were going right here! There's a 4' x 10' area surrounded by a 6' concrete fence that just so happens to be sitting a couple slabs of concrete. It gets sun almost exactly half the day and provides a barrier to a good portion of the elements. Never having designed anything more elaborate than a fence, we did our best to design our first coop! It's not much more than the basics, but that's what's important after all. 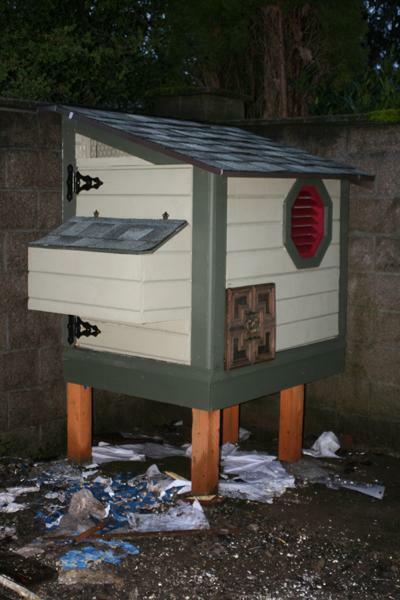 It had a coop off the ground to guard against Oregon weather (aka rain). 2' posts into the ground to guard against the wind that takes down trees every winter! Ventilation on the sides not covered by the 6' fence. A door that hinged open on the coop for easy access and cleaning. A run that hinged open so that we don't have to crawl around under it. And a gutter for our oh-so-lovely rain to have somewhere to go! It wasn't perfect, but it was a good starting point. The main problem was that it was too small. There's a limited amount of space at the end of the run, so we could only build out so far. Everything did get larger, though! Instead of a 3' x 3' coop and a 3' x 7' run, we designed a 3' x 4' coop and a 4' x 10' run. We had to extend it under the coop, which we originally didn't want to do because we didn't want to have to crawl under there after chickens, but we ended up having to in order to accommodate the space. We put the lid to the nest boxes at an angle so that water could actually run off of them. Moved the vents for what we're hoping will be better air flow. We had originally decided to build the coop as close to the fence as possible because we thought it would look strange if there was an 8" gap between the coop and the wall, but it ended up being more work than it was worth. So, we just pushed the entire coop out 8" from the fence. To start off the posts, then, we picked a starter post to measure all of the others against and marked where the rest of the posts should go in relation to the first one. Then, we dug 2' holes at all of those locations. In order to get the posts to stand up straight, we poored a little bit of sand in the bottom of the hole in order to create a flat surface for the posts to stand on. 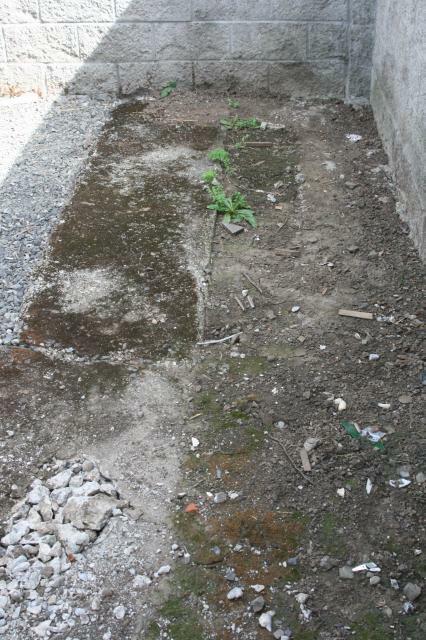 Then, we added or took away sand until the post stood at exactly 2' under the ground. After that, we adjusted the post until it was level. Then, we put two stakes in the ground (one in front of and one to the side of the post) and nailed a piece of wood to each of the stakes and the post. That way, the stakes held the posts into place. We repeated the process for the rest of the posts. There are 4 posts for the coop and 2 more for the end of the run. The two in front of the coop (posts in the front left) run from the ground to the top of the coop (the roof runs at an angle, which is why they're two different hights). 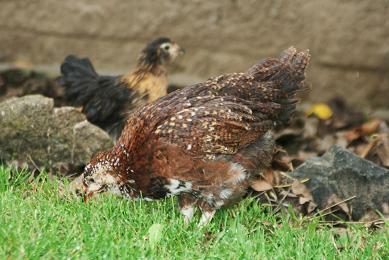 And the two in the back only run to the base of the coop because they're set in to the coop. We had originally wanted them to run to the top of the coop as well, but, since they had to be set in because of where the concrete had to go, they could only be 2' tall. Otherwise, there would be a post running through the middle of the coop and that wouldn't really do us any good! We had oh so many problems with the concrete! What we thought would take us a couple days, ended up taking 3 weeks! We kept having to wait for sunny days to poor the concrete and put tarps up afterwards to guard against the rain and then we kept underestimating how much concrete we needed, so we kept having to go back and get more concrete! 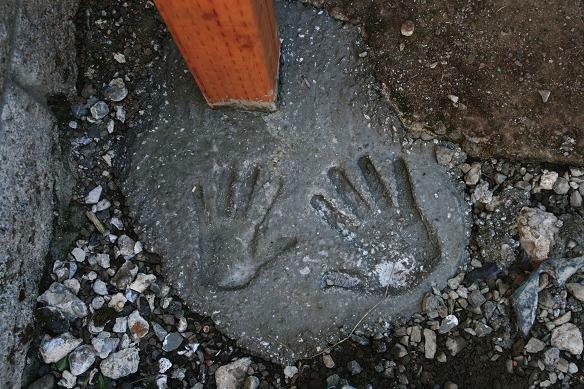 All in all, we used over 1,500 pounds of concrete and something like 12 days on this project. I do believe that that was overkill! But this chicken coop is going to survive the apocalypse. It's not going anywhere. Why, oh why must it rain so much? 8 weeks into the project and we've been rained out more times than we've actually worked! The frame was a little strange in in of itself. The posts only being in two of the corners meant that we had to strategically make support beams. 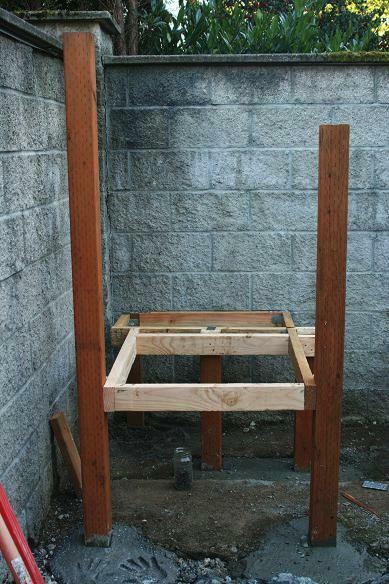 We had to run beams along the four posts as well as to the back of the coop in order to hold up the side without posts. You can't see it in this picture very well, but there's another post in the back left corner. It isn't set into concrete, but sits on the ground. Beams that aren't sitting directly on a post set into concrete (all but the two in the middle) also have L brackets in the corners in order to help support the base of the coop. 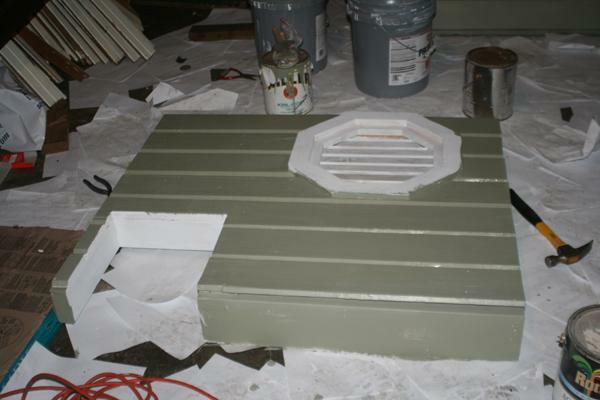 After the base was done, we put a 1/4" piece of plywood on top of it. We built each of the sides separately because it makes it easier to move the walls around and hammer nails in at what would have been impossible positions! 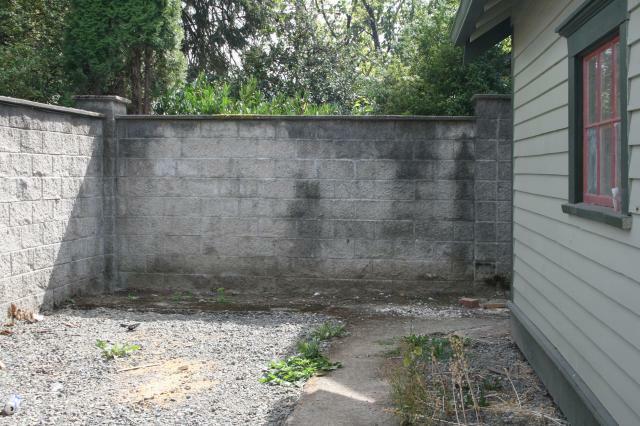 It would have also made it impossible to paint the back walls, seeing as there's only an 8" gap between the fence. 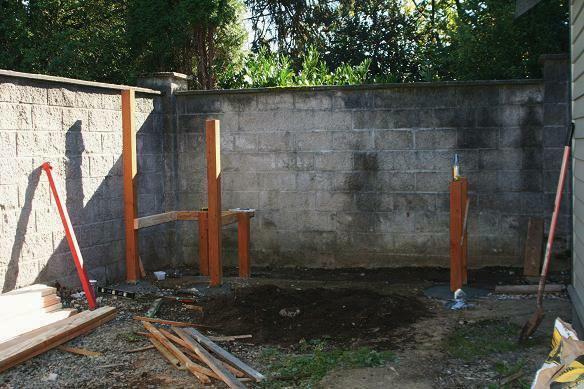 What we did for the walls is, we added in the posts on the two corners in the back that didn't have them. Then, we framed each wall in 2x4s and put support beams up at about 1' intervals between them. The right wall, however, only has one support beam and the 2x4 on the bottom doesn't run the length of the wall. It ends at the 1x1' chicken door. We did that so that the chickens wouldn't be tripping over the 2x4. A window is going to be where the other support beam would be. 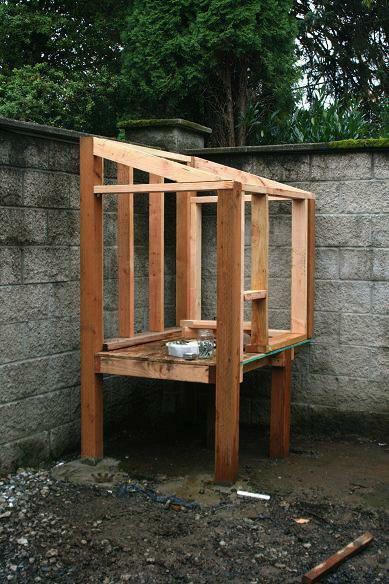 So, a little later on we built support beams that framed the window and added the rest of the support to the wall. The two back walls are also framed toghether. The two back walls are actually nailed together at this point. Since the two posts in the back were added in, they're not attached to the base of the coop. So, we nailed them to the back walls. Since the left wall and the back wall share a post, we nailed it to both of them. Which means, that the two back walls are framed together. That means that we had four walls in three sections (the back two, the right wall, and the front wall). The front wall is actually a door that swings open. It has been build, but it didn't make it into the picture. It goes in that gap in the front where there aren't any 2x4s. The wood that is on the front wall that you can see (the triangular pieces that connect the two posts in front) are actually attached to the posts. The piece on the bottom of the triangle squares off where the door will slide into and the piece that finishes off the triangle on top of it holds up the roof. They're held together by some L brackets and heavy duty deck nails (they're 5 or 6" long concrete nails that have a spiral to them. They're almost impossible to bend, which is fantastic!). If you're wondering about the nest boxes, they're attached to the wall in front that swings open (the one that's not in this picture. It is shown in the next set, though). We started designs in mid September and started construction in early October. It's now November and we're just now starting to put siding on! It's been a little bit of fun and a lot of bickering over the best way to do this, where that should go, and who can actually drive a nail! 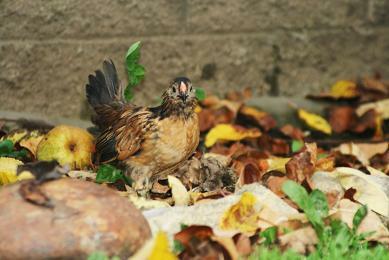 The little chickies have tried to help along the way, but have been rather unsuccessful in their endeavor. They're afraid of the rain and the skill saw, so they've mostly just been under a bush on the other side of the lawn and trying to figure out how to eat worms. Which is the cutest thing ever! We've spent about $200 and 8 or so afternoons. We've gone through 4 boxes of nails, 2 pieces of plywood, 5 posts, 12 2x4's, and 1,500 pounds of concrete. We only had enough plywood for two of the walls, so we put plywood on the back two. Then, we nailed siding onto the plywood. 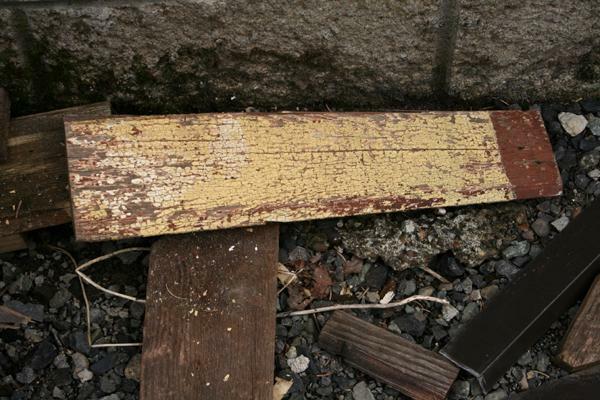 When the previous owners put new siding on our house, they kept a lot of the old siding that was still in good condition. So, we took the old siding and used it for the chicken coop. Which meant that, not only did it match the house, but we didn't have to buy any new material. For the walls without plywood, we took the pieces of siding and nailed them directly into the wall's frame. It didn't make for the best insulation, but we figured that a few cracks here and there weren't the biggest deal. It might even help with ventilation. With the window and door, there were some tricky angles to make, though. For the window, we cut a piece that ran over the window, layed it on top, drew a line on the siding where the window was, and cut along the line. It didn't always line up perfectly because we did this entire project with a skill saw, but we filled in the gaps with wood puddy and then painted over it. The pieces along the left side of the chicken door (1x1' square in the bottom left) were a little trickier, though! That's about an inch of siding there and you can't put a nail in that without spliting it! So, we had to use wood glue to keep it in place. By the way, we did not make that window. We actually found it in the garage and thought it would be perfect. They're about $20 at Home Depot, but ours was free. It took 6 days for the paint to dry because, apparently, paint doesn't dry below 30 degrees! So, not only were we working in the garage because it was snowing outside, but we had to wait in between each coat for the paint to dry! So, we weren't done painting until the end of December. 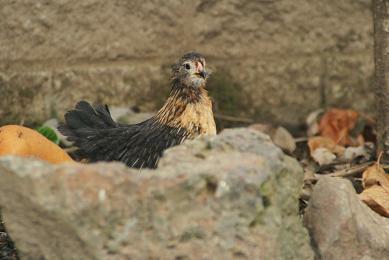 I'd hoped to get the chickens in by Christmas or New Years at the very latest, but that wasn't going to happen! We've gone through another box of nails, 5 pieces of trim, 30-40 pieces of siding, and a gallon of paint. 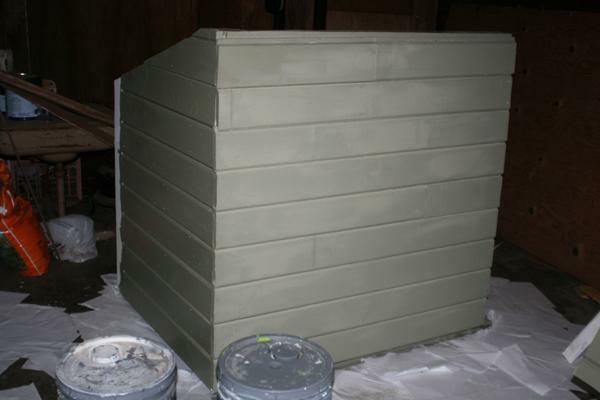 The siding and paint (which is actually 3 different colors and some primer) we already had, though. So, we only ended up spending about $45 on trim and nails. We thought that that would be the easy part! After all, what could be so hard about nailing the walls in? Somehow, after the concrete had set, the pressure treated wood warped on one of the posts... Not entirely sure how that happened because that's why you use pressure treated wood and set it in concrete...! But, oh well. After sitting for a couple months, there was a fairly sizeable bow in the front right post. So, we had to nail the right wall to that post and the nail that wall to the back wall. 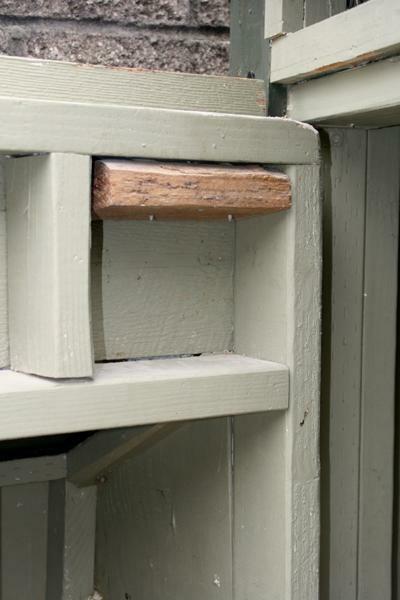 Then, nail those walls to the base of the coop in order to try to bend it back into place. It's not perfect. The right wall is a little crooked and doesn't line up perfectly with the back wall, which is a little ascew itself because it's nailed into a crooked wall, but with everything a little off, it fit together alright. The front wall was another huge pain. 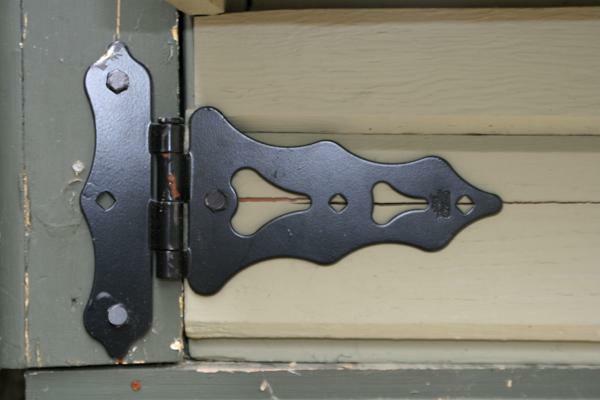 That entire wall hinges open and it ended up being too tight to hinge open properly after the right post warped. So, we had to sand that down again and re-paint. Which, wouldn't have been such a big deal i we had a belt sander... or really any kind of sander. We ended up using a chisel and one of those metal horse shoe sanders. It took forever. But, we did finally get it to hinge open. But, we put a piece of wood on the inside to give it some extra support and the door seems to open and close without it being an issue. We assembled the coop, it was time to put the roofn. 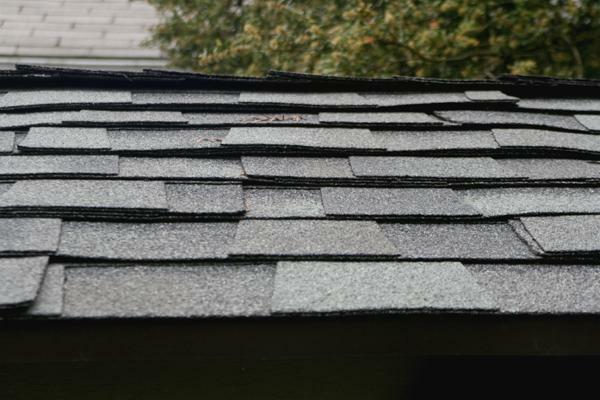 Initially we were going to use tin or some kind of grooved plastic in order to cut down on the cost of roofing, but we found tar paper in the garage and already had roofing nails, so just buying the shingles wasn't that much. The roofing was pretty easy, though. We cut a piece of plywood to hang 6" off the front sides of the coop (aka the ones not against the fence). We were originally going to put a gutter in, but couldn't find a piece long enough. So, we just put the hangover in and are hoping that it doesn't create too much of a rain problem. At the top of the coop, there's a part where the roof isn't at a slope (because of the 4x4 post). That meant that we could either cut the 4" posts at an angle, build up the walls to fit the angle, or just bend the shingle a little bit to accomodate the angle. So, we just put another piece of plywood up. After that, we were on to the tar paper and the flashing. The tar paper was easy enough. We layed it out, marked the right length, scored it with an exacto knife, and bent along the crease, which finished off the cut. Then, we nailed it in place and repeated until the roof was covered. It was the flashing that wasn't so easy. We got two different sizes or flashing. One longer piece for the back of the coop and another shorter piece for the rest of the coop. The problem with the flashing, however, was that we didn't have anything to cut it with. We ended up scoring it with an exacto knife and cutting it with a hand saw. I wouldn't recommend it if you have anything else to cut it with, but it worked fine for us. After that we put the shingles up. They cut the same way the tar paper does (measure, score, bend, and it snaps off). When we got to the top where they need to bend, we just gently bent them into place. 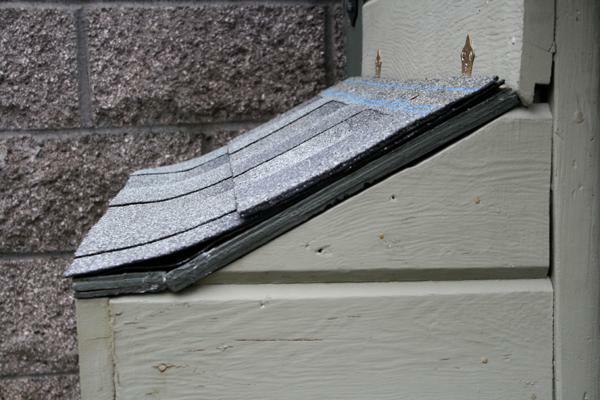 Shingles do actually bend! Not well, mind you, but they do bend. If you just try to force them into place they'll snap, but if you gently coax the bend it works. We had to do the same kind of thing for the nest boxes. We built the frame in a 1x1x1' square and then added a slope on top of that in order for rain to run off. But, that meant that we had the same problem with a slope running into a flat surface. So, we put a piece of plywood along the slope and the flat piece and then attached it with L brackets that we bent into the right angle. For the roof, we did the same thing as we did for the coop with two exceptions. 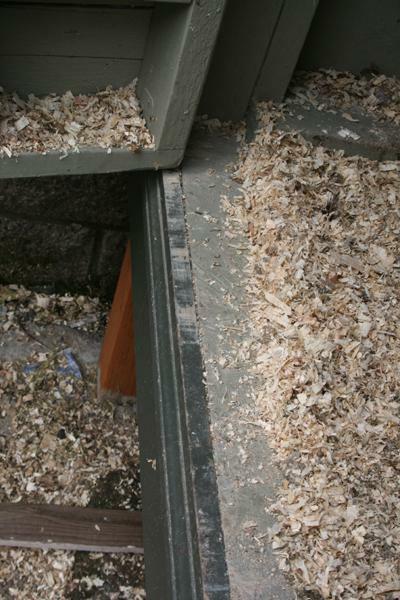 First, is that we couldn't put a nail in the slope where the two pieces of plywood met. 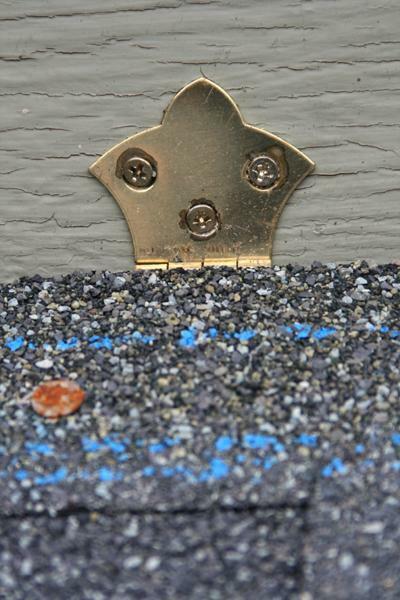 If you put a nail there, then you have to worry about water running through the nail and damaging the plywood over time. 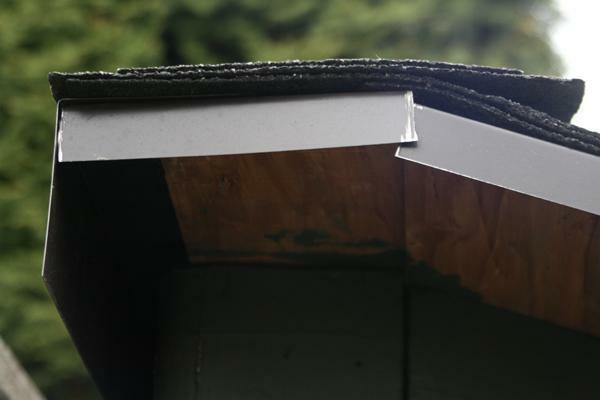 And, since we don't want to have to worry about the chickens getting wet or having to replace the plywood, we just bent the shingles and glued them into place. 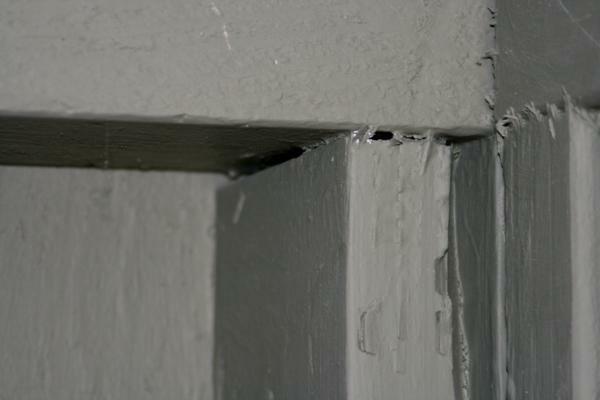 Since we didn't actually have glue that would work for that, we ended up using caulking. 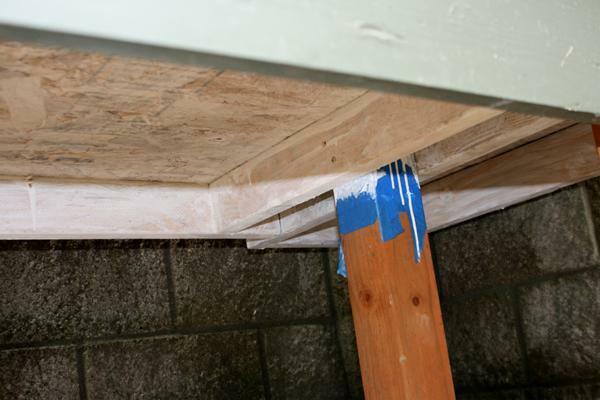 We were using caulking for its original purpose on another project and thought, you know what? That might work on the chicken coop, too! We had another problem with the top piece because it didn't line up perfectly. So, we had to cut it in half and then nail it in place. Next was theentilation. 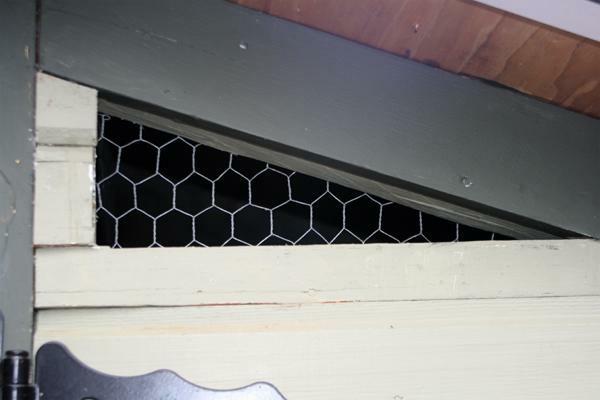 In between the door and the roof, we left a gap and just nailed up some chicken wire. We were originally going to paint the inside of the coop white to add extra light, but then we realized that we only had interior paint. So, we decided to paint it the same green as the outside. That way we could just hose it down when we wanted to clean it and we wouldn't have to worry about the paint coming off. The roost was easy enough. We just took some scrap branches from a tree we'd pruned and nailed it to the wall. They're still not very good at hoping up on things, so we only put it a foot and a half off the ground. When they need a taller one, we're going to move it up and add a second one that runs along the back wall. After that, we hung the food and water in. 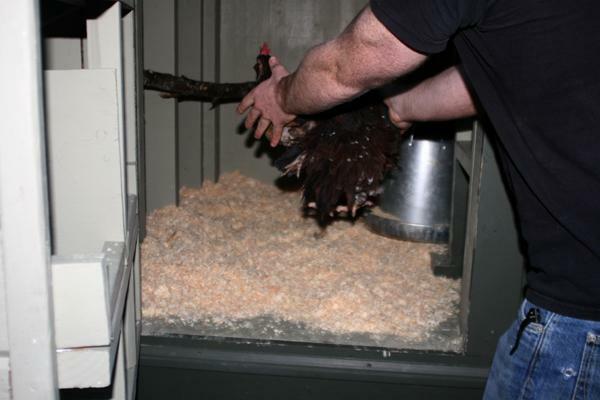 The food hangs, so there are no problems there, but the chickens have always had problems with getting wood shavings into their water. So, we built a little stand out of 2x4s for it to sit on. You can't see it in this picture, but there pieces of wood that come up in the back to keep it from getting knocked off. And then it was haitable for chickens! The brown door on the right is temporary. When we build the run, we're going to build a door for the chickens to get in and out of, but, since it wasn't necessary to build for the chickens to be in the coop, we didn't build it. It's actually off a cabinet we had lying around. We just pulled the door off and nailed it onto the coop. The door we build is going to be smaller and green. 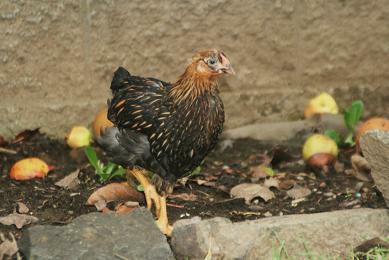 On January 14, 4 months after we started this, the chickens are finally able to move in! It took another two weeks for the roof and everything. 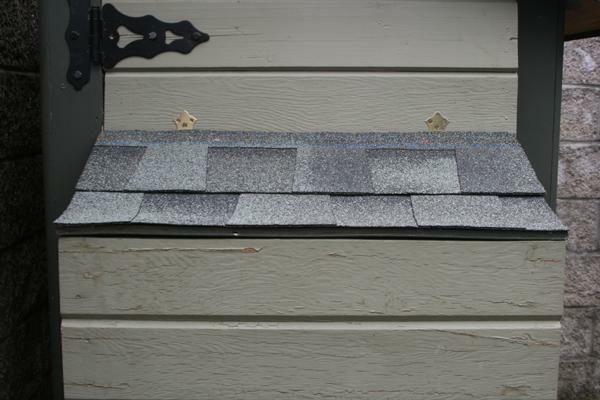 We used some tar paper, a thing of shingles, two sets of hinges, and a negligible amount of chicken wire. The shingles were $15, the hinges and the chicken wire we'd already bought, and the tar paper was free. We still need to build the run, but that's going to be on a little hiatus until we get the skill saw fixed. We used out the blade. 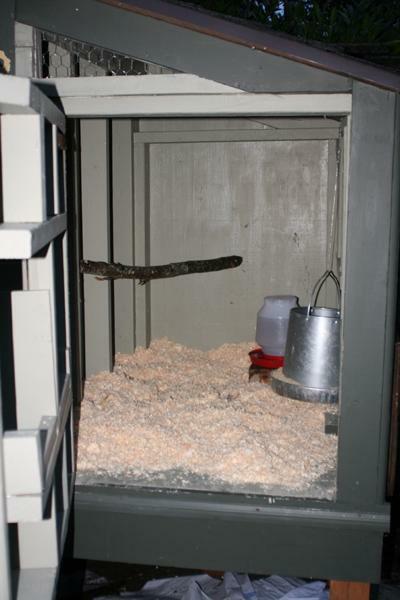 "Beautiful , functional hen house"
Lots of plans and measurements. The amount of information is overwhelming for me , but I’m not building a coop. Amazing attention to details , ventilation and hardware. I’m sure this will serve you well for many years , I’m also sure others will build it . Enjoyed reading about your coop. 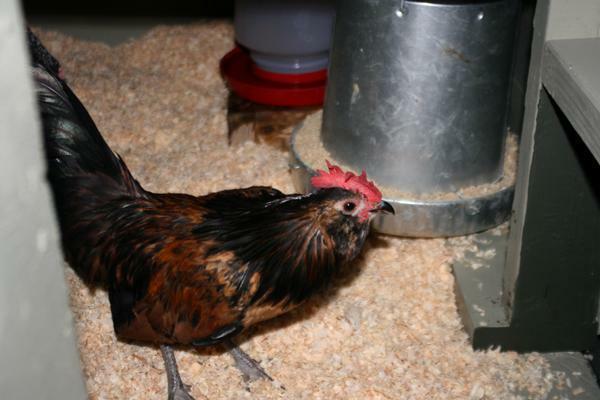 Just got my chicks and am starting my coop this weekend and most likely will be designed similar to yours. Did you ever get your run built?